While going through my restaurant posts last year to make my list of the Best Restaurant Experiences of 2014, I was reminded of the great Ms. Rosemary Bulleit cocktail we enjoyed at Thally and wanted to try mixing something similar. The drink we had at Thally was made with Bulleit bourbon, Dolin Blanc, Luxardo maraschino liqueur and Thally's house-made ginger soda with a rosemary sprig garnish. It was a great example of using whiskey in a cocktail that still turns out bright and refreshing. Of course, I changed it up a bit. I used Bulleit's rye instead of their bourbon, Lillet Blanc instead of Dolin Blanc, ginger beer instead of house-made ginger soda (not something I have on hand, unfortunately). I also added lemon, giving the drink a nudge toward a whiskey sour. The result has a nice whiskey flavor, but isn't a "brown" cocktail like so many winter cocktails, as it manages to be more light and refreshing. It's a great drink that can be enjoyed year-round. Thally has a lot of great cocktails on their menu. If you haven't been, I definitely recommend it. The food is also quite good. Inspired by the Ms. Rosemary Bulleit cocktail at Thally in Washington, D.C. Combine whiskey, Lillet, maraschino liqueur and lemon juice in a cocktail shaker. Add ice and shake until very cold. Strain into a rocks glass with ice. Add ginger beer and stir gently to combine. 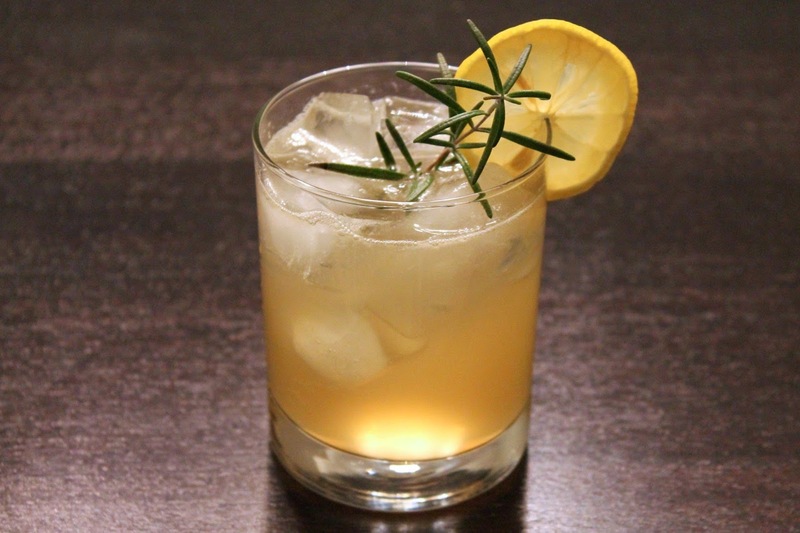 Garnish with rosemary and lemon wheel. I'm digging whiskey drinks more and more these days. Is it the cold weather? Must be. I've been really into them too, although I like that this is a whiskey drink that could be enjoyed year-round.